Growing up in the small town of Westree, Ontario Al lived in a house with no running water, no plumbing, and even at one point a pet moose. Al was used to living off the land and appreciates every small thing nature has to offer. Starting out at a young age, Al’s dad taught him and his sister all about the outdoors and the best way to catch what the local forest had to offer. Al shot his first deer, his first bear, and started guiding for northern outfitting companies in his teenage years. Bow hunting is a large part of Al’s hunting experience and knows the rush of the finally being able to draw back on an animal. Having 12+ years of experience as a hunter Al has been able to successfully harvest deer, moose, caribou, bear, and looks forward to the tail end of small game and water fowl season each year. Born and raised in the Sudbury area, Kyle started hunting at a very young age with his Dad. Kyle started out small with grouse and made his way up to deer and moose. The family's passion for the outdoors and hunting brought them together and brings them back together each fall with the family deer hunt. Kyle’s start in bear hunting really came about when Kyle and best friend Al discovered they shared a passion for the hunt. Not long after taking up bear hunting, Kyle was able to harvest his first Black Bear in Westree, Ontario. As he got older, Kyle bought his first bow and hasn’t looked back. The focus required, and the rush of adrenaline you get when the animal walks into your view, hooked Kyle immediately. With 10+ years of experience hunting bear, deer, moose, and several small game animals, Kyle anticipates each coming hunt. Tyler was born in Nakina, ON and like all northern boys he grew up fishing with family and friends. Ty spent long summers and cold winters out on the lake reeling them in. Family played a big role in Tyler’s outdoor experience, he spent every summers out on Cordingly lake at his uncle’s camp fishing in bass derby’s and canoeing with his friends. This northern boy lives and dies out in the wild. As a kid, Tyler hunted small game with his dad and uncles but never took a shot at the big game hunting. When Tyler moved to the ‘big city’ of Sudbury he started looking into black bear and other big game animals. Participation in big game hunts have help form a lasting bond with the NBO crews and reignited his passion for the outdoors. Tyler tagged out with his first deer this year and looks forward to his first bear season. New to the world of hunting, Laura stared hunting in 2016. Having got her outdoors card at 16 she never used it beyond the occasional fishing trip. Now, with the encouragement of Al, Kyle and her older brother, Laura has been on bear, deer, wolf and small games hunts with the NBO crew. 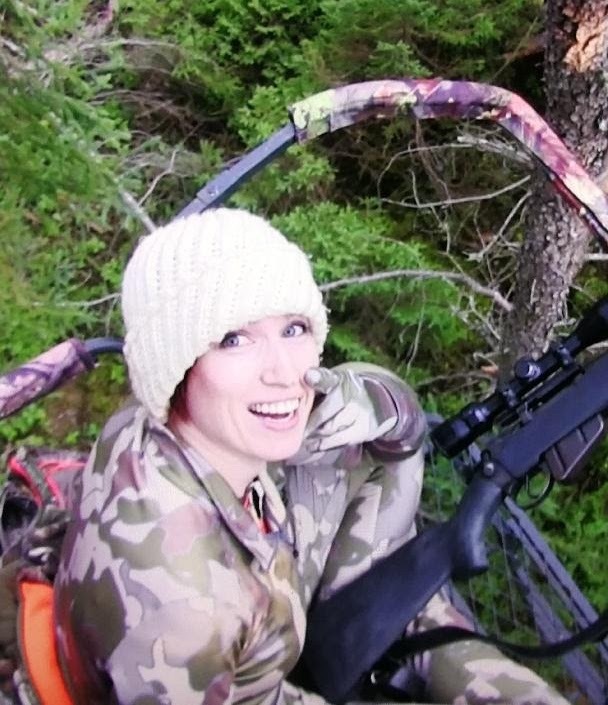 Laura spent summer as a kid on the farm or in a tent and while this is her second season as a hunter she doesn't shy away from the bush life and all it has to offer. You'll usually find Laura behind the camera or the computer screen but all that changed this year. Now that she's got her first bear she can't wait to fill the freezer again this season.